Both of our clinics have a surgery suite for routine surgical procedures. Spay, neuter, dental cleaning, mass removals and basic emergency care can be performed at either of our locations. Patients that require a more involved surgery are referred to our Silver Valley Veterinary Clinic in Pinehurst. Orthopedics and surgeries that require hospitalization would be among these referrals. 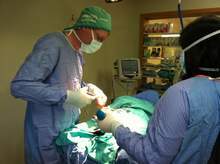 Dr. Doug Walker and assistant Tresa Johnson in surgery with an orthopedic patient.